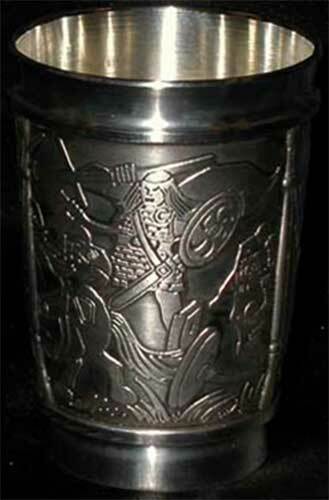 Irish whiskey glass is an embossed pewter design that depicts the legend of Cuchulainn and Ferdia. This Irish whiskey glass from Mullingar Pewter features a card with the Cuchulainn and Ferdia legend. Cuchulainn was one of Ireland’s earliest heroes who resided in Ulster and was leader of the Red Branch Knights, the defenders of Ulster. As Queen Maeve’s soldiers set out to attack Ulster, the Red Branch Knights were all struck by a strange weakness which was brought about by a magic spell. They lay helpless in their hour of danger. Only Cuchulainn, their great hero, was fit to do battle, as he was free of sickness. He ordered Laeg, his chariot driver, to prepare his horse and chariot. When the warriors of Maeve arrived at the River Dee, on the borders of Ulster, Cuchulainn had to face them alone. In a shallow part of the river – called a ford – he fought and killed the best of Maeve’s heroes, one after another, in single combat. At first, Maeve’s greatest champion, Ferdia, took no part in the fight. He had grown up with Cuchulainn and he loved him like a brother. Maeve knew this but she tried to turn him against Cuchulainn. “Cuchulainn says that you are hiding in your tent because you are afraid of him”. She told Ferdia. Little by little, Ferdia’s love turned to hate and in the end he agreed to fight against his friend. The two champions faced each other on the banks of the river. They fought for two whole days, but they were the equal of each other in skill and bravery. Each evening Ferdia sent food and drink across the ford to Cuchulainn, while Cuchulainn sent Ferdia herbs for his wounds. On the third day they fought all day long with their heavy swords. When the sun went down, both warriors were very weary and this time they parted without a word or sign of friendship. At sunrise on the fourth day they faced each other in the middle of the shallow river. Back and forth they battled and so loud was the clash of their swords that it was like far-off thunder. Soon the river was red with their blood. Laeg, who was Cuchulainn’s chariot driver, stood on the riverbank and urged his master on. As he did so, Ferdia saw his chance and drove his sword into Cuchulainn’s body. The Ulster Hero was sorely wounded. Quickly, Laeg sent Cuchulainn’s magic spear, the ‘Ga Bolga’ floating downstream. Falling to his knees, Cuchulainn grabbed the deadly spear and he put it through Ferdia’s heart. As the noble hero fell, Cuchlainn took him in his arms and carried him to the grassy bank. “How sad it is, my friend, that we should part like this” sighed Ferdia, in his dying breath Cuchulainn felt only sadness in his moment of victory and he wept bitterly. Soon afterwards, the Red Branch Knights broke free of the spell and came to help Cuchulainn. Together, they drove the Forces of Queen Maeve from the borders of Ulster. 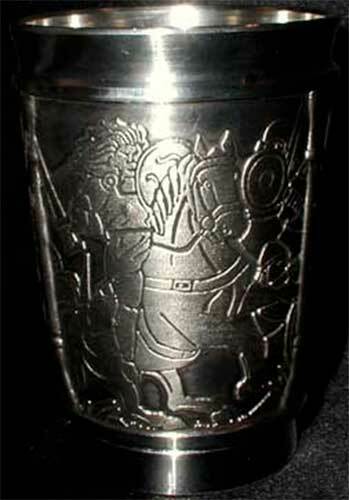 This pewter whiskey glass features the Irish legend of Cuchulainn and Ferdia depicted on three embossed panels. The Irish whiskey glass is a lowball or double old fashioned size that measures 3" wide at the rim and stands 4" tall; the 10 ounce glass is made of lead free pewter. The Irish legend whiskey glass is made in Ireland by Mullingar Pewter and it is gift boxed with the Cuchulainn and Ferdia legend, complements of The Irish Gift House. 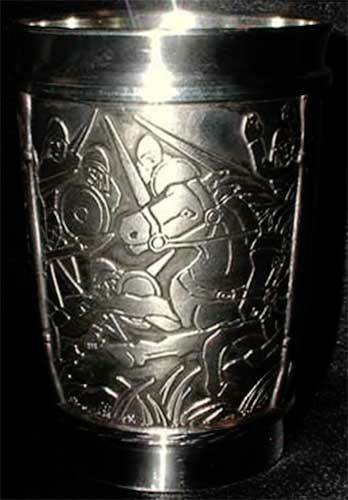 Irish whiskey glass is a pewter design that depicts the legend of the Hound of Culainn. Irish whiskey glass is a pewter design that depicts the legend of the Salmon of Knowledge. Irish whiskey glass is an embossed pewter design that depicts the legend of the Children of Lir.